Enjoy everything that the Dominican Republic has to offer - Warm tropical breezes and relax in the ocean or rip it up on a kite-board right in front of your condo. This surf-side haven offers 4,000 square feet of luxury featuring a gourmet kitchen with granite counter-tops and stainless steel appliances, spacious dining and living rooms. With 4 bedrooms and 4 bathrooms, this magnificent condo comfortably sleeps 8-10 people: the master bedroom includes a bathroom en suite and ocean views, the second and third bedrooms both have queen size beds and private baths. Bedroom 4 is equipped with two queen size beds. The terrace includes outdoor seating and table for eight and views to the breathtaking gardens, pool, beach and the ocean waves. 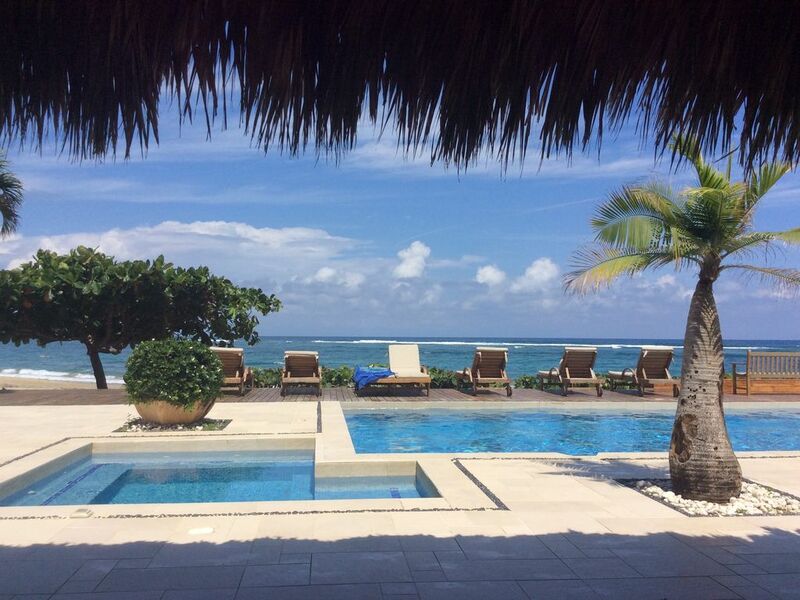 Our family purchased this property after vacationing in Cabarete for more than 10 years. Cabarete is the perfect place to do all the things our family loves to do at the beach like kiteboarding, surfing, paddleboarding and enjoying the beautiful weather and interesting and friendly people. The ground floor location provides easy access to the pool, deck, beach and ocean. We find everything we need is close by and enjoy walking to town for dinner and the nightlife. Located right on the beach at Kite Point, the best view on Kite Beach. Awesome condo with plenty of room for two families, super well maintained common areas, nice pool and good kite surfing shows! For kiters, the launch/land spot is perfect with Sandro and Wilson ready to help! Had some issues with Internet and the A/C and were quickly resolve by Calin, the manager. Super responsive and kind support! As always, the food prepared by Maribel and Elizabeth was a bonus for our vacation! Thank you for the comments and we agree, Calin is awesome and responsive. We look forward to having you stay with us again! The condo was beautiful and very large. The maid came at the correct time the first time and then the second time she came two hours early and some of us were still in bed. We told the manager and she apoligized for the inconvenience but then the maid came two hours early again on the last day while we were trying to get ready to leave. The hot water didn't work in two baths for two days. We didn't realize that the whole area has inadequate sewers so no toilet paper could be flushed down the toilet in the condo as well as in the town. Gross! We are sorry you had that experience with the maid and the lack of hot water. We have corrected both items. We are also sorry you received misinformation on the ability of the system to handle TP. Our condo and the entire Ocean Point community can handle TP in the system and we apologize for any inconvenience this may have caused for you and your family. Wonderful place for old and young alike. Property is very nice and roomy. This place is big! Scott and company were very helpful. Right on kite beach so convenient for kiters. Our whole party had a great time. No issues at all. Thanks for staying with us Dave. Hope to see you back next year! We had a wonderful stay. Perfect location for kiters with kids. Safe and secure. The property is beautiful and well maintained. Loved having access to the pool and the beach below. Amazing views and sunsets. The condo is spacious and comfortable so plenty of room to spread out. Only thing it was missing was a grill for dinner preparation (with kids in tow we did most of our meals at the condo). Thanks Scott! Hope to be back soon. Thank you Richard and we will look into getting a grill for the future. We appreciate the feedback. The place is beautiful, clean and big! No risk of being cramped. The location was perfect , close to town but quiet and the locals were very friendly. We loved watching the kite boarders while relaxing at the pool. We are so glad you enjoyed our place...we think it is pretty special too! We hope to see you back soon. Spectacular Property on Kite Beach! We were looking for the perfect family place to spend a week celebrating two college graduations and one high school graduation. We found it at at Ocean Pointe!!! First of all, the pictures are very accurate! I walked in to exactly what I was expecting. Our kids were blown away with everyone having basically their own en suite for a week. The bathrooms are modern and well-equipped. The kitchen and laundry provided all the comforts of home. There are several areas to relax, watch a movie, read, etc. And everyone has a seat at the table for dinner! This place is BIG!!! The property was clean upon arrival and included housekeeping twice during our week. What a treat! The owners contacted us several times before we headed to Cabarete, answering our questions and providing us with their on-site property manager, Calin's, contact info. Calin was very helpful - and also happens to own the FAB Kite Beach Cafe next door, featuring fried plantains with sweet chili dipping sauce that we all are still craving. The grounds, pool and beach are right off the patio of this property - and are beautifully maintained. Seems that we had the pool to ourselves most days - and the kites overhead are lovely. FYI, the pool does not have a shallow end for little bitty kids - so they will need to be watched. But for our teens and twenty-somethings, it was perfect. While we did not kite surf (lots of surf schools nearby), the kids did paddle board across the street in a lagoon. FYI, I don't think they would do it again. We chose to rent a car - and enjoyed exploring the area. But you wouldn't necessarily need one, as there are a few restaurants right next door and two doors down - and the walk on the beach into Cabarete is lovely and only about 20 minutes to a plethora of restaurants. We highly recommend La Casita de Papi, Lazy Dog, Gorditas and Fresh Fresh. We loved exploring the grocery stores in Sosua and Cabarete, as our high school grad was our Spanish interpreter. The newest store in Sosua - Super Pola - is beautiful and has Valentino's Ice Cream Shop just inside the front door, which we frequented during our stay. The other grocery, Supermarcado Playero, is almost like SuperTarget, with lots of offerings other than just food. And Janet's in Cabarete is good as well. Having the kitchen - and being able to eat breakfast and lunch while at the pool or beach was a plus. We have awesome memories from Ocean Pointe and Kite Beach! Thank you for renting with us and appreciate your comments! Come back and visit soon. Located just 20 minutes east of the Puerto Plata Airport, Ocean Point 1 is located at Kite Beach just outside of Cabarete within a gated community of 4 luxury condominium buildings with a total of 18 units. Overlooking the beautiful gardens, pool, beach and ocean. You are right in the middle of the kiteboarding action on Kite Beach. A 20 minute walk or 5 minute cab ride puts you in downtown Cabarete, and all the great restaurants, bars and amenities you need such as pharmacy, banks and grocery stores.